It is the end of the year. Glory to God for keeping us and always being there for each and every one of us. Glory to God forever more! The year 2018 has been good for some people, while to others it has been a mixture of good and bad. Don’t be discouraged by whatever you might have gone through in the past year. Count God’s blessings in your life since the start of the year and see that God is great. Pick up your journal and begin to list them one by one. Start with your goals for the previous year. How many were you able to achieve? How many have you not achieved? Thank God for them and look forward to a greater 2019. God is going to do a great thing for you in the year 2019! This New Year is a great dawn for you. Celebrate! God says that the expectation of the righteous man/woman will not be cut short (Prov 23:18). It is very certain that God will meet all your expectations in the New Year 2019. Your aspirations, goals, and vision will manifest in this year. Hear the word of God concerning you and your family from the book of Isaiah 43 verse 19. God says, “Behold, I will do something new; now it will spring forth; you will know it. I will make a way in the wilderness and rivers in the desert for your sake”. As a believer, you have been given the authority over every circumstance of life. Therefore you need to declare and command year 2019 to do what you want it to do for you. As the Lord spoke to Ezekiel in the valley of dry bones to speak life to a non-living thing (dry bones), you can also prophesy into the New Year to obey your voice and it will be so for you. Take your prayers very seriously because God will use it to take you to where you need to be in the New Year. In the name of Jesus, I declare God’s blessing upon my life and family in this new year. We walk in perfect health. We will not lack any good thing. Every member of my household is delivered from wicked and unreasonable men. All that we lay our hands on shall prosper. The grace of the Lord Jesus abounds for us in the name of Jesus. I decree that my career/business/job shall move forward in 2019. Every transaction that I partake in shall be successful. Every of my target shall be met. My goals and aspirations shall be accomplished. I prophesy blessings, prosperity, success and fruitfulness into all my endeavors. I will not be ashamed in the name of Jesus. Profit is mine. Doors of opportunities open for me in their own accord. There shall be promotion and expansion in my business/career and job in the name of Jesus. In this year, no evil will happen to me. I will not be a victim of misfortune or negative circumstances. The angels of God will keep every member of my family safe and sound. There shall be no weeping or bad news from me or concerning me or any of my relatives. We are delivered from every epidemic, disease, or sickness. Perfect peace and state of mind is ours. The Lord will heal my household and make us have rest on every side. None of my loved ones will die prematurely. We will live long enough to see many more years in the land of the living in the name of Jesus. Amen! 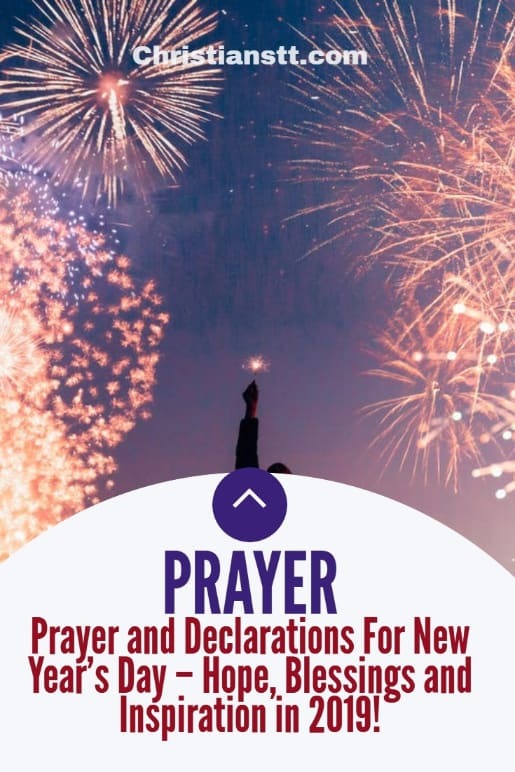 Prayer for Blessings throughout this Year 2019!